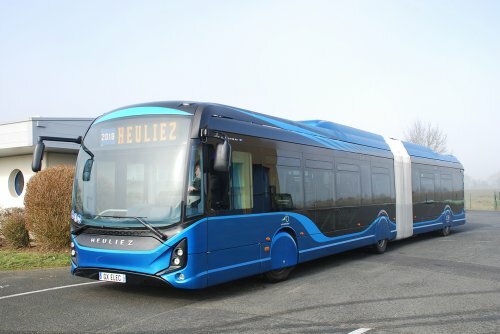 Heuliez Bus has received its largest order to date for its newly launched electric city buses. Qbuzz is purchasing 49 articulated Heuliez GX437s that will be used in the Groningen and Drenthe regions alongside the 60 Ebusco vehicles already reported in International News (CBW1387). Delivery will start in December 2019 with an option to replace a further 51 units within four years leading to the complete electrification of the entire regional bus network. The GX437 was chosen by Qbuzz because of its Lithium-ion NMC battery system, says Heuliez Bus. The battery can be charged both slowly overnight or, thanks to its rapid charging technology, in the daytime while on the move allowing for more long range journeys. The interior specification includes USB charging ports, WiFi and air-conditioning. The lightweight structure is made of 100% stainless steel. The body is manufactured using composite panels and the chassis has reinforced protection. The GX437 can transport more than 100 people. The saloon has been fitted with an “innovative translucent articulation” says the manufacturer and additional triangular windows to further enhance the “airy” feel of the interior.